Simple living, minimalist designs, multi-functional furniture…all of these things have been around for centuries. We like to think that our focus on functionality and design is brand new but their roots date back for centuries. Occasionally we hope to uncover some of these historical lessons that have inspired our type of minimalism. I can think of no better way to kick this off then with the magical furniture of 18th-century craftsmen Abraham and David Roentgen. 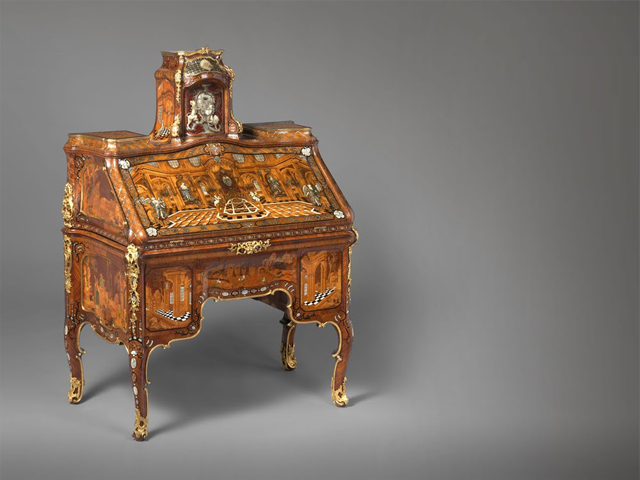 Abraham Roentgen (1711-1783) and his son David Roentgen (1743-1807) were German cabinet makers that designed and created pieces of furniture that were artistically stunning and mechanically dazzling. Their mastery of their craft is apparent in both the incredible decorative detail throughout the work but also in the clever, sleek design of the moveable pieces. They worked all over Europe and had shops in Berlin and St. Petersburg. Their clientele was among the most distinguished Europeans including Queen Marie Antoinette of France and Catherine the Great, Empress of Russia. This work absolutely blows me away. Especially when you consider that all the craftsmanship and mechanical ingenuity was constructed without the use of electricity and power tools and transported all over Europe without cars or trains. The work of the Roentgens has a direct relationship to the multifunctional, transitional type of possessions we trumpet in our pursuit for a more minimal lifestyle. Don’t get me wrong…we definitely will not be recommending people get a secretary’s desk on this scale, but there are core components about their designs that inspire us today. These designs focus on how people will actually use the furniture. Take all those hidden compartments for example. They serve multiple functions for day-to-day life. People needed a place to hide valuables or important paperwork away from prying eyes. The hidden compartments served a specific purpose for the women of that era. At that time it was improper for women to allow their toilettries to be seen. Therefore, many of them needed to hide their unmentionables inside a desk or drawing table to conceal their existance. These desks also needed to be used for just run-of-the-mill tasks as well. Writing letters was made easier by having a drawer that contained an inkwell and sand sifter. For the painters, there was an easel that popped out at a 45-degree angle. There were also musical components and clocks integrated into the designs. As all designers should, the Roentgens listened to their customer’s requests and created products that helped fulfill their desires. As an ideal, we are always looking for objects that are functional and also look beautiful. Because what is the point of surrounding yourself with all of these space saving designs if they are ugly? These desks epitomize that goal. So much expert craftsmanship and attention to detail went into the designs and the result is something that works well in the home and you are proud to put out and display. We are looking to surround ourselves with objects that make us smile and these desks are just fun. If you slide a lever and a hidden compartment pops out of a desk and you don’t giggle a little, I don’t know what will. Because ultimately we are drawn to the things in our lives that are fun and give us the most joy. So why not strive to make every object in our daily lives playful and enjoyable to interact with.